Submitted by Taps Coogan on the 18th of March 2019 to The Sounding Line. 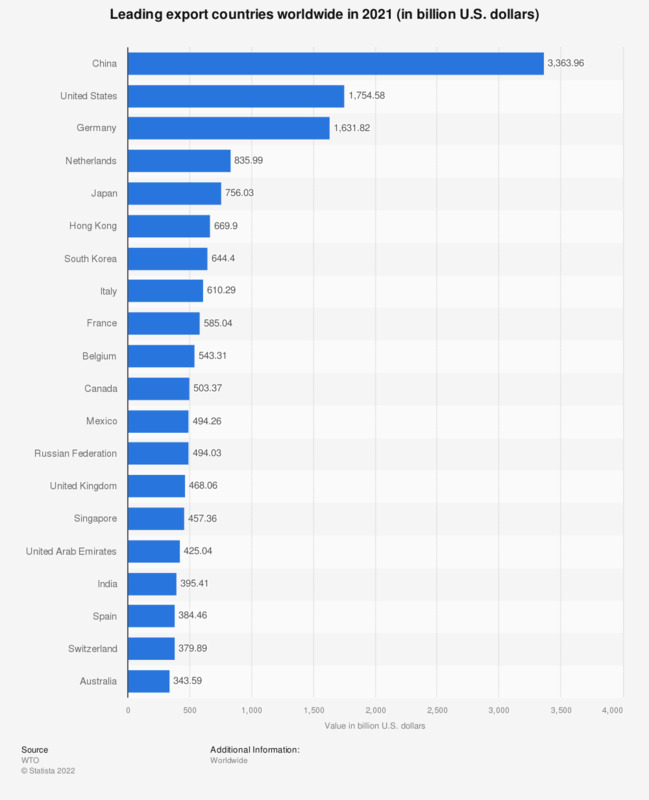 China, the US, and Germany are by far the largest exporters in the world. Combined, the three countries represent nearly a third the $17.7 trillion of global exports (30%), with the next largest exporter, Japan, exporting less than half of Germany or the US, and less than a third of China. In order to visualize the trading reach of China, the US, and Germany, we have created a map which reveals whether any given country imports more from China, the US, or Germany. To be clear, the map does not show the largest import source for any given country, simply whether it imports more from China, the US, or Germany. 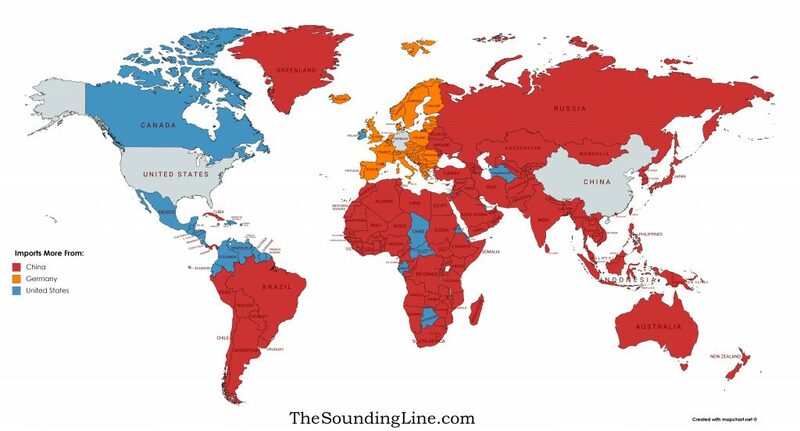 As the map shows, China beats out the US and Germany in nearly all countries throughout Asia and Africa. There are a few exceptions where the US comes out on top, including: Turkmenistan, Qatar, Israel, Eritrea, Djitbouti, Chad, the Central African Republic, Gabon, and Botswana. While not shown on the map, the US is also the larger exporter to some Indian and Pacific Ocean nations. See the detailed map at the end of the article for micro-states. Of the three, the US is the top exporter throughout most of Central America, the Caribbean, and Northern South America. Germany is the top exporter throughout nearly all of Europe. Outside of Europe, Germany is not the top exporter to a single major economy, further reinforcing the centrality of the EU to Germany’s economy. Roughly 61% of Germany’s exports are consumed within the EU. Nonetheless, Germany is the top exporter to the Palestinian territories and a few Indian and Pacific Ocean nations.